Are you using potentially dangerous methods to clear your constipation? Well, odds are you’re going about it all wrong. Sure, cramming as much fiber down your throat as possible will make you go (eventually). Yet, that’s only because you can’t digest insoluble fiber, so it has nowhere else to go. That’s the way most think about constipation, which is a BIG PROBLEM. They believe it’s just a mechanical process. “What goes in must come out”… right? The earth was once believed to be the center of the universe too, yet we’ve long since moved on from that false belief. Now it’s time to let go of this false belief that constipation is best treated mechanically with fiber and/or copious amounts of water. Most are completely missing the hormonal component to hypothyroidism and constipation that really needs to be addressed. We’ll talk about this in a minute. First, it’s important to understand that sometimes these mechanical approaches to constipation can cause more harm than good. Since I’ve already mentioned fiber, let’s start there. Thyroid function declines with age, so it makes sense that constipation becomes an increasingly more common problem the older we get. Unfortunately, because of this, most are turning to the poor advice of depending on fiber supplements to keep themselves regular. While we may not be able to digest fiber, the harmful bacteria in our intestines can. Ideally, our small intestines should be clear of bacteria. Yet, as a hypothyroid sufferer, you’re at an increased risk of a bacterial overgrowth in your small intestines. So, the fiber that’s helping to keep your bowels moving is also feeding the harmful bacteria in your gut. 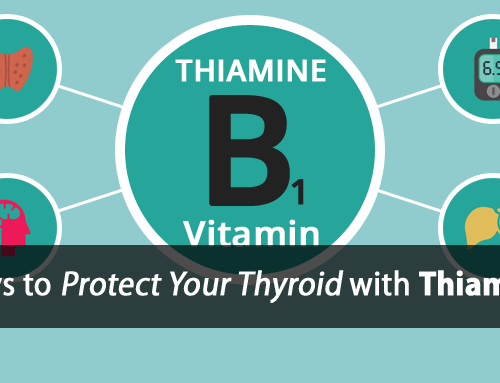 Inhibits thyroid hormone conversion by the liver. Inhibits liver detoxification, increasing the thyroid suppressive effects of estrogen. Increases gut permeability leading to leaky gut syndrome and increased digestive inflammation. Increases the production of thyroid suppressive stress hormones including cortisol and serotonin. With that being said, there are safer ways to use fiber. I’ll explain how to do that shortly. It’s one thing to drink adequate water (or liquids) to keep yourself hydrated. It’s another thing to think that drinking 8 to 10 glasses of water a day is going to solve your constipation woes. Water retention is regulated largely by your hormones and metabolism. In hypothyroidism, your metabolism is low and your cells are already in a weakened state. This makes you more susceptible to edema, or water retention. By over-consuming water you’re pushing more water to your cells, making you even more susceptible to water retention. The more water your cells retain, the more weakened they become. In other words, over-consuming water can further weaken your cells, prevent your cells from using thyroid hormone, and further suppress your metabolism. Neither of these approaches do much to address the underlying cause of your hypothyroidism and constipation. When it comes to hypothyroidism, there are many hormonal effects that contribute to constipation. 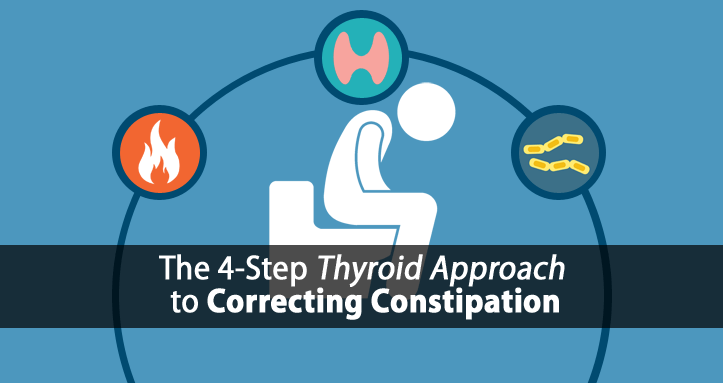 If the hormonal effects of hypothyroidism are what causes constipation, then we must aim to correct those hormonal effects as the solution to the problem. Here are some ways we do just that. In hypothyroidism, your stress response becomes over-active. It’s how your body is designed to compensate for your hypothyroidism. Over time this also leads to the release of many inflammatory mediators that can drive systemic inflammation in your body, including your digestive tract. Dr. Raymond Peat explains that when the intestines become inflamed, the walls of the intestines swell considerably, narrowing the passageway and slowing the movement of food through the intestines. Of course, restoring thyroid function, lowering stress hormones, and reducing the inflammation is the overall goal. Dr. Peat also refers to other safe anti-inflammatory products that can help lower bowel inflammation that we’ve used successfully with many of our clients including baking soda, aspirin, safe anti-histamines, and cascara. Here’s another perfect example of how your hormones can cause constipation regardless of your dietary habits. Constipation is a common symptom of PMS (premenstrual syndrome), indicating that there’s a strong hormonal component involved. Yet, when it comes to chronic constipation, few think of hormones and estrogen dominance as a contributing factor. In hypothyroidism your liver loses the ability to detoxify estrogen, allowing it to build up within your cells. Progesterone production is often impaired as well. This leads many thyroid sufferers to develop chronic estrogen dominance (men included). While many wrongly blame progesterone for constipation and other PMS symptoms, research has shown that it’s estrogen that’s the true culprit. Estrogen rather than progesterone cause constipation in both female and male mice. While restoring thyroid health is important in correcting and preventing estrogen dominance, there are also certain supplements that can help too. We often use both our Molecular Progesterone Oil Complex and Vitamin E Complex, both which have strong anti-estrogenic effects, to address this with our clients. As I mentioned previously, there are safer ways to use fiber. It boils down to the type of fiber you’re using. You probably hear about the protective benefits of fiber all the time with respect to colon health. It’s true that some sources of fiber are safe. But with hypothyroidism and high levels of harmful bacteria, there’s an increased risk of bacterial fermentation of fiber, which is well known to promote colon cancer. Relationship between dietary fiber and cancer: metabolic, physiologic, and cellular mechanisms. However, there are some safe sources of fiber that are both naturally resistant to fermentation and have anti-bacterial properties that help lower the levels of harmful bacteria. With our clients, we focus on the use of carrot fiber and bamboo shoots for this purpose. By lowering your levels of harmful bacteria, you also help lower the levels of bacterial endotoxin that is produced within your digestive tract. Reducing endotoxin helps to correct the underlying hormonal issues that contribute to hypothyroidism and constipation as well. Specifically, it helps by lowering estrogen and stress hormones. As metabolism slows, inflammation naturally rises, contributing to the inflammatory effects of constipation discussed previously. Yet, a slow metabolism contributes to constipation in other ways as well. Without adequate thyroid function and metabolism, your cells can’t produce adequate energy. When your cells can’t produce adequate energy, your digestive tract slows down, increasing your transit time. The slower your digestion, the greater the risk of bacterial fermentation mentioned above. Restoring healthy oxidative metabolism and energy production to your digestive tract is another important step in restoring digestive function and ending constipation. Both thyroid hormone (T3) and sunlight are helpful to stimulate healthy oxidative metabolism. When working with clients we also often use baking soda, coffee, and certain B-Vitamins as well. As you can see, there’s more to constipation than filling yourself full of fiber, water, and other things to increase the bulk of your stool. Don’t get me wrong. Moving your bowels regularly is essential to your health. There are many things mentioned in this post that can help you safely do just that. Yet, there’s a huge hormonal component that has been long overlooked for decades. Instead of just slapping a band-aid over the problem, focus on fixing the underlying issue by fixing your hormones. So eating apples is bad because of the pectin? What about fresh herbs like basil, cilantro or parsley? What other fibers besides basil and bamboo are ok to eat? Boiling/cooking apples does help to make them safer. You also have to consider how much is in an apple vs. how much is used as an additive/thickener to other products. Yes interesting to hear more about fruit fiber. Also I would love an article about water retention. Especially, puffy eyes in the morning. Thanks! What about glucomannan/ konjac ? very popular these days. Tom could you explain more on the baking soda. Do you just add it everyday say to your orange juice and treat it like the carrot salad and bamboo or is this something you do when things are just not moving very well because of say stress. Tom is it ok to eat homemade pickled carrots? The kind made with salt brine? It is partially fermented so I wonder if that is a problem. Do you sell bamboo fiber? I don’t want to eat the canned ones from China. What about pectasol c city’s pectin for detoxifying metals? Where do you get the bamboo? Lisa… I have seen bamboo shoots in local groceries stores in asian food section. also aldi has it in glass jars.